China's population stands at 1.3 billion people. Often in our discussions about infant abandonment, domestic adoption, and other issues pertaining to International Adoption, we fail to see the trees for the forest. It is a big forest. Population estimates indicate that there are approximately 330 million couples in their reproductive years (20-50) in China. If these couples have the same infertility rate as couples in the West (10%), that equates to 33 million childless families. The following story is a succinct yet heart-felt recounting of one Chinese woman's journey to motherhood. I met her on one of my research trips, and her story touched me deeply. It is a story that is at once familiar to many of us, yet also clearly illustrates the differences between our journeys and those in China. It makes for profound reading. One trying day towards the beginning of autumn 2002, due to a serious disease I was to have my uterus removed from my body. I never expected that I would have to face such a nightmare. My husband and I were just married and had yet to produce children. If my womb was taken from me, that meant that we would never be able to have children that were truly our own. This, in the eyes of a woman possessing Chinese traditional thinking and Chinese traditional desires, was a mortal blow. I have no way to convey the internal anguish caused by the loss that I had no choice but to face. "Health is most important!" This is the sentence that my husband and family kept repeating to me. These words comforted me and encouraged me to do my best to actively cooperate with all of the doctor's work. Fortunately my illness was only in the initial stages, and so under the devoted care of my husband and family my body gradually recovered. At last, the continuation of my life was assured. The days passed quickly, and my health continued to improve. We passed through the year happy and well. Nobody ever touched on the topic of children. My family worried that I was thinking too much of what I had lost and was quick to tell me once again that health is most important and to remind me to be sure to focus on my own recuperation. No matter what they would not abandon me. Nonetheless, the issue of children could only be briefly avoided. It had to be faced sooner or later! I began to ask myself repeatedly "What should I do? What should I do?" I thought about it for a long time, but I could never make heads or tails of these perplexing questions. Truly, I had to admit that this disease and my inability to have children brought my husband and family immense pain and misfortune. This pain and misfortune certainly influenced the sentiment between us to a definite degree. As far as our future was concerned I did not want to think too much. That was too far away! My husband is a good person, and he was innocent. Nonetheless, divorce was the solution that I least wanted. Only if my husband were to bring it up himself would I respect his decision and accept divorce. To ask another woman to bear the child would also be quite a complex matter. I simply would not want to face the awkwardness and the bother in the future, and such an arrangement would no doubt cause me to sink back into anguish. Adoption eventually became the only natural choice. It was the choice that was best for my entire family, but what would they think? Would they accept it? At the beginning of 2004 our parents came to spend the Spring Festival with us. Mother brought up the topic of children. I was delighted to find out that they also supported adopting a child. For this decision I knew they had to throw away many of their traditional ways of looking at things, so I was moved to think that it had come out of concern for the future of my husband and I. Moreover, I was moved to feel gratified and at the same time to feel twice as much guilt and obligation towards them as before. They were so kind and reasonable! This kind of parents is really very hard to find. My heart was really lifted then! Frankly speaking, to make that kind of decision, from the perspective of a very conservative mother and father, is really very hard and demands enormous courage. The only thing that I could do at the time was to silently resolve to warmly accept their approval. Oh my honorable parents! Just after telling me their opinion on the subject, mother said that due to the traditional way of thinking in our old home we would have to keep everything a secret from all of our neighbors and even our relatives. This all was to avoid the cold stares of those folk. Moreover, since my husband and I were constantly away from home working with few chances to return, it would be easy for those around our home to believe that the baby was indeed ours. We all therefore agreed with my mother's decision. I especially had no reason to disagree. I knew that this was a kind of necessary evil, and I deeply understood its importance. As far as my husband was concerned, he also approved of adopting a child, but he wanted to do so under a few conditions: He wanted a child from a completely normal healthy family. Specifically, he did not want a child born out of wedlock or one born without knowledge of his father. Secondly, he wanted to know some basic facts about the child's parents including about whether or not they had any hereditary diseases, their looks, and their moral character. Once satisfied he could agree to adopt. In fact, to a definite degree his way of thinking was in our best interest, and anyway I knew to adopt a child is somewhat unfair from the perspective of a husband. Who doesn't want to have their own child? I could only do my best to satisfy his small requests. Thus, we all agreed to adopt a child, and sooner rather than later. In the male-biased old home of my husband, some women, in order to give birth to boy, first gave birth to more than a few girls. Owing to the fact that these households lack the ability to properly raise these children, most are sent to households that can better afford to do so. For this reason, we decided to look for opportunities to adopt children around my husband's old home. As soon as our parents returned home they began to make inquiries in all corners. In July of 2004, a close relative that works in a hospital called. She said that a woman there that had just given birth to her third girl was looking for a family in reasonable economic straits to which she could send her child to be raised. At the time as our mother was away visiting relatives, as my husband was wavering in hesitation, and because other potential adopters had already begun to make inquiries we soon had no choice but to let this opportunity go. After this I could not avoid feeling a little regretful and ended up spending the next few months in pain and anxiety. 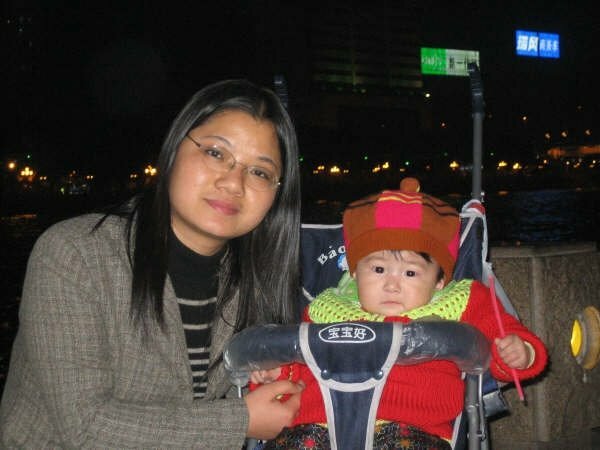 Somewhere around the Spring Festival of 2005, while talking with a friend I came to learn that she had adopted a lively and loveable little girl through an orphanage. Really pleasantly surprised, I decided to go to the orphanage myself. Perhaps I really would be able to get what I so desired from this unexpected opportunity. As I began to fill with hope I bustled about, inquiring about phone numbers and touching base with many welfare assistance centers. I made inquiries at the orphanage in the area that I was originally registered to live in, the one in which I now lived, the area where I work, and many other areas, totaling over ten orphanages. Nonetheless, contrary to my expectations, among them all I could not find any healthy baby girls to adopt. Outside of Guangxi province's Yulin city's center, all the centers used whatever reasons they could to turn me away. The thread of hope that had just been lit was extinguished in a moment. I was utterly disheartened. Here I say that I was terribly disappointed that the orphanages told me that they had no children for me to adopt. Why? Why? Why? I wondered if these orphanages really had no babies for me to adopt, or if they did have babies but they never give me a chance. Why did they say no to a person who really wanted to adopt a child? They seemed to not care what I thought, and made me feel like salt was being poured into my wounds. I felt lost, and no longer knew what to do in order to find a child for my family. China is a very traditional country, and most of the people are still very traditional and closed-minded. Nearly every couple hopes to have their own children, but 99% wish to have their own biological children. Some families, however, are not able to have biological children due to illness or other reasons. For these families life is very difficult, and since they can't have biological children, many get divorced and part ways. Adoption is the only way that many of these families feel they can stay together and remain as a family. For most infertile couples to be denied an adoption opportunity like I was would deal a fatal blow to many marriages. Just as our entire family had once again sunken into helplessness, the relative from the hospital brought us some more news. She said that in the last couple of days a friend had come asking for her help. Her friend was to have a baby in just two months, and it seemed most likely that it would be her third girl. This friend wanted to give birth to a boy, so now she was looking for someone else that could raise this girl child. Speaking honestly, as far as our family was concerned, this really was exciting news! From our relative we came to learn more and more about the woman's family situation until we were completely satisfied. What's more the family of the child agreed never to see the child again. Even my husband willingly assented. After two long months of anxiety and anticipation, our long-awaited little girl finally arrived. Although we did in fact feel sorry for the little girl's family, we simply could not control our excitement. When the girl finally arrived the whole family was really very happy. We were really so happy then! Our little girl is an extremely lovely, beautiful, clever, little sweetheart. She is the best gift that heaven has given our family. When I was arranging for our girl's hukou (household registration permit) mother put forward the idea of looking for someone to help us arrange for the hukous for a set of twins (one boy and one girl). She said that way if one did not work, for whatever reason, we could just get rid of it. I knew then that they were thinking that we might want to adopt another child, a boy. Honestly, why didn't I want to bring up another kid? That way would be healthier for the child's development then bringing him up alone, but we had to face reality. To bring up a single child is a great expense especially in a big city. We have to consider their education, medical treatment, and other costs. In our current economic state we really could not shoulder the burden of supporting two children. We could not afford to ensure that they both remained healthy or to give them any kind of truly beneficial childhood! It would be best just to raise one child and bring her up with all of our heart and soul. Such was the unanimous opinion of both I and my husband. Speaking truthfully, I can understand why mother was thinking what she was. I can't blame her. Nonetheless, speaking from my innermost being I could only stand for raising one child. Yet, my heart was full of contradictions, really complicated feelings. Every scene from before was again flashing before my eyes. Mother and Father really exerted so much of themselves for me. During that brief period of time when I was in the hospital they took care of me in every possible way. After I got better, they still unceasingly encouraged and consoled me. They used all of the love that they had to forgive me for all the trouble that my disease had brought them. They were really an unfathomable pillar of support. I really should not once again be the cause of the sadness of these kindhearted parents! I thought then that perhaps I should stand in their position and think over the issue once again for their sake. So, being so moved, I have come to agree with mother's opinion. I hope that I can bring her a little comfort. When our girl was half a year old we received a bit of news. There was a family that already had a grown boy, but now its mother had accidentally become pregnant once again. What's more the period in which abortion was allowed had already passed. If the baby born was a boy the family wanted to send it to someone that could take care of it. Father and mother were very happy to hear this bit of news, but because my husband was still entirely against adopting a baby boy they had no choice but to abandon this opportunity. Yet the matter is really not fully over and done with, we still don't have any way to know the final outcome. My husband's opinion on the subject is still the same as before. Now even I don't think about it too much. Everything that happens has its reason. In short, no matter what, the thing that I most want to do is take very good care to raise my little girl well. I want to do my utmost to see that she can grow up healthy and strong. Wow .... what a wonderful story that you share again with us Brian! Thanks for posting that woman's story, Brian. It just goes to show that the hopes and desires of those wanting to start a family are the same everywhere. Brian, I loved this article. Shows that Chnese women and American women have the same emotions. I can almost feel her pain as I felt mine at the time of my miscarriage. Thanks for this-very enlightening. Thank you Brian. I am glad this family had the means and opportunity to make their dream come true. However it continues to frustrate me that they had zero luck inquiring at the local orphanages to try to adopt a child. This is just wrong, no matter how you slice it. I agree with Julie. China must open up to domestic adoption. It's a sin to let a child grow up in an orphanage when there are wonderful families waiting for a child to call their own. Thank you so much for sharing this heart touching story...no matter which country we live all of us have the same desires. It seems to me that this story has two sides. One is that the SWI's turn away potential adoptive parents, but the other side is the cultural stigma against adopting a child that has no family history or has family bad looks or family bad moral character. In addition, the fact that the adoption must be kept a secret even from extended family is cultural. What must be done to encourage domestic adoption is to do away with the cultural stigmas that keep people from considering adopting an orphan. When this is done, the orphanages will have to open up their doors to what would hopefully be the new throngs of people requesting to adopt. There seems to be two sides to this problem. One is that the SWIs discourage domestic adoption by claiming that there are no healthy babies. The other side is there seems to be a cultural bias against adoption. That the adoption of a child must be kept a secret, even from extended family, the child must not be a child born out of wedlock, from a completely normal, healthy family, a family that has decent looks, good moral character, etc. is discouraging as well. These cultural issues cannot be blamed on the SWIs. When these biases are eradicated, then perhaps the SWIs will have to open their doors to the hopefully throngs of people who want to adopt a baby from the orphanage. I can relate to wanting a child so much. I cannot relate to wanting to adopt to please or appease my in-laws or feel grateful for their acceptance of an adopted child. This is very informative in many ways. Now I can see how the thinking allows mothers to abandon their children. The pressure to please must be enormous. It's cleary well ingrained. This was fascinating and very moving to read, please pass on my thanks to this woman for allowing you to share her story with us. It seems to confirm what I have read elsewhere that so many of the domestic adoptions in China are not made through official channels and that many of these children are "found" homes rather than being brought to a SWI. I remember seeing a documentary on China where a baby was found at a busy railway station and was "given" by the Station master to a gentleman who wanted a child rather than being brought to the local SWI. However, my adoption agency director (who is Chinese) has told me on several occasions that domestic adoption from SWI also DOES happen, the process is very different with families going to the SWI to "choose" a baby but it does happen and in increasing numbers. I have no reason whatsoever to not believe her. I was also told that the system for domestic adoption is going to become more uniform and more like that for IA once the CCAA has taken over its adminstration. If domestic adoption from SWI is not possible in China then what domestic adoption would the CCAA have to oversee? They certainly couldn't administer the unofficial adoptions that take place. When my husband visited our daughters SWI the assitant director also confirmed that some of the children from that SWI are adopted domestically. I don't know why this woman was told there were no babies available for adoption by the SWIs she contacted maybe they didn't have any babies young enough or healthy enough? I am sure it must have been very upsetting and frustrating for this woman to be told by the SWI that she could not adopt a baby from them. I am very glad she was able to build her family through adoption. I have wondered whether some SWI have become a little "weary" of the exacting demands of some domestic adoptive parents. From what I understand sometimes they can be a little demanding with regard to age and physical beauty of the baby and wanting to know info on biological parents. I hope that domestic adoption continues to become more socially acceptable in China and that the CCAA makes the system easy for people to access. Again, very interesting and illuminating to read. I also should add that our guide in China adopted a little girl (as a single mom!) at 6 months of age about 7 years ago. She told us the process was easy because there is no privacy in China and therefore a homestudy was minimal. I sent her pictures of the girls in our travel group and she was very happy to see them. In her words, "these girls deserve good families". We also had an exchange student from China staying with us just after we got our referral of our daughter. She was completely unaware of China's adoption program and was silent when I showed her the referral pictures from my Yahoo group. I asked her if a couple was allowed to adopt a baby out of the SWI's if they already had a child and she gave an emphatic, "NO!" Domestic adoption does happen in China. I just wish it happened more often. Actually, nearly half the families that doemstically adopt have an older (usually grown) child when they adopt. I had no idea that the inability to have children would have such a profound effect on marriages in China. That the woman would have accepted her husband's decision to divorce speaks volumes. Google is upgrading their blogger program, and in the process the comments to this blog have disappeared. I am hopeful they will reappear soon. Wonderful post. Many of us waiting to adopt from China have very little insight into the other side of the coin as it were. I'm so glad that this woman was able to finally adopt herself. I'm curious to know if the Chinese authorities restrict domestic adoption in order that more healthy babies are available for international adopters? That does'nt seem right to me. I just returned with from China with our 34 month old son who we adopted from an orphanage which had never placed a child for international adoption before. I was privileged to be allowed to visit his orphanage which was located in a very rural part of Guangdong Province. There were only 5 children remaining in the orphanage because all of the children who were abandoned and found were adopted domestically within 1-2 months of being brought to the orphanage. The children who were living there when I visited were 6-8 year old boys who were visibly mentally disabled and one infant girl who had leukemia. The orphanage director told me that several local families had wanted to adopt our son, but they couldn't because his paperwork had already gone to the CCAA - he has a repaired cleft lip, palate and hernia. I was so heartbroken to learn this - our son could have grown up and lived in his motherland, but instead he is now living half a world away with a Caucasian family. When we first adopted from China 6 years ago, domestic adoptions were not even talked about. I am so heartened that at least some orphanages actively place children domestically. I wonder how many other small orphanages throughout China are also placing children locally. I hope that the answer is many, many. I think it is so sad the way people think in China. For this poor woman to say that she was grateful to her family to FORGIVE her for the disease she had is just SAD!!! Then she went on and on about how they stood by her when she was in the hospital and so on. These people are suppose to be family...isn't that what family is suppose to do? China is certainly a different world and I am so glad we are in the USA where we aren't treated with such cruelty.